Xbox360Fanboy.com 是同一個公司下得其中一個 blog (其他包含 DSFanboy, PSPFanboy...等). 他們最近 report 了一份 xbox.com 改版的 walkthrough. 有很多的註解與 screenshot 值得閱讀. 很可惜我忘了前一版的風貌所以本人無得比較但強烈的 xbox branding 從色彩運用設計的極簡易性上有卻實的代出了. 唯一缺的是好像覺的少了一點 Xbox360 該有的科技感即給電動玩家的動感. 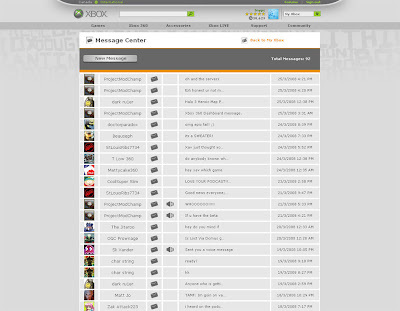 若以 Xbox360fanboy 貼出來的 screenshot 把顏色背景換掉的話感覺其實跟 social networking 網站如 Facebook 沒有差多少. 值得關注的是所有的 Friends List, Achievement, Recent Players, 甚至連 Messenger Center 幾乎都採用相同的設計. 這會不會讓使用者很容易混淆現在自己在哪一頁? Consistency 是很重要但是以上的幾個頁面所該有的重點是不相同的, 不適合混合運用. 還有密密麻麻的小圖示讓整個畫面看起來有點複雜而不是增加色彩加分.